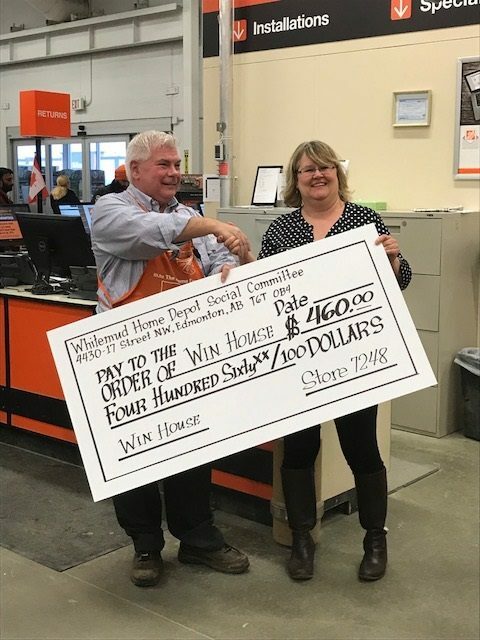 A huge thank you goes out to staff at the WHITEMUD HOME DEPOT (4430 – 17th Street) for their amazing fundraising capabilities throughout the month of March! Together, they raised $470 for the women and children living in shelter at WIN House. This amount included $420 cash and a $50 gift certificate! With three shelters to care for, we know we will put this generous donation to immediate needs. This amazing bunch supported WIN House last year and raised $300. They were determined to beat that amount this year and so they did! By almost $200! Fantastic! All of the staff, volunteers and women and children at WIN House appreciate the amount of time and effort THE WHITEMUD HOME DEPOT STAFF took to generate such a large amount. Their unlimited kindness and support means the world to those we shelter and we thank them ALL from the bottom of our hearts! Thank you!